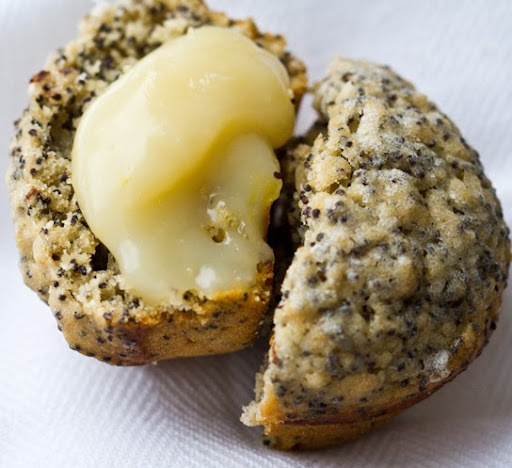 It's a lemon-lovers party as I dot deliciously creamy Vegan Lemon Curd on lovely Lemon Poppyseed Muffins. 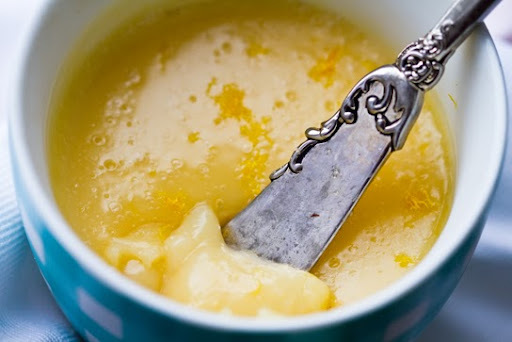 Every time I wander into a gourmet store and see a tiny sweet jar of Lemon Curd, I grab it and read the ingredients label hoping that by some miracle, someone will have invented vegan Lemon Curd to be sold in stores. But alas, the butter and egg-filled delicate lemon-y spread is never, ever vegan. Until now! And if I would've known how easy vegan lemon curd could be, I would've made it a long time ago and saved myself the longing. 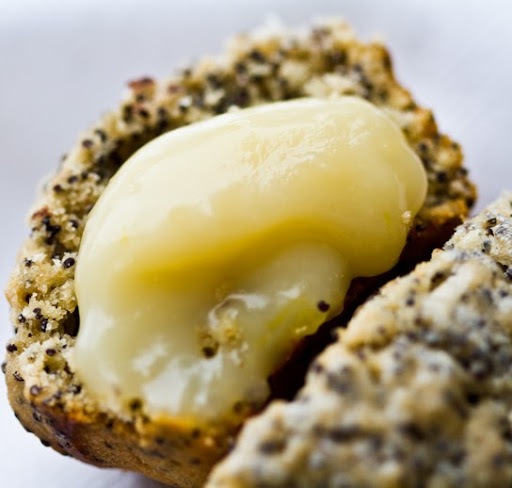 Oh, and I've paired this spread with a delightful batch of Lemon Poppyseed Muffins!.. 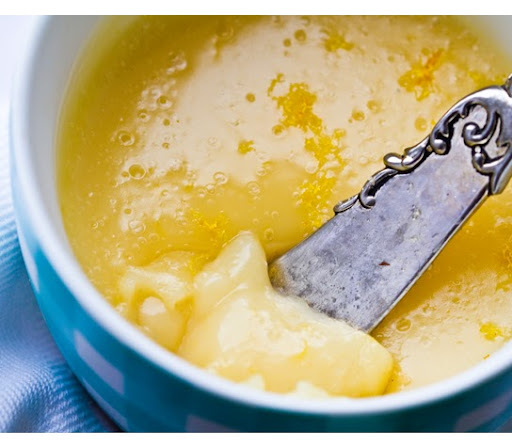 Lemon Extract recipe note: you'll notice that each of my recipes calls for an optional dash of lemon extract. This adds an extra boost of lemony flavor - but is totally optional. 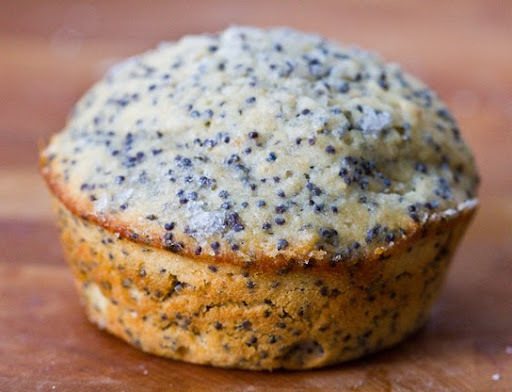 I like it in the muffins, but for the curd it is very optional. 1. In a soup pan, dissolve the corn starch in the cold soy milk and water. 2. Turn heat to medium-high and continuously stir the mixture. 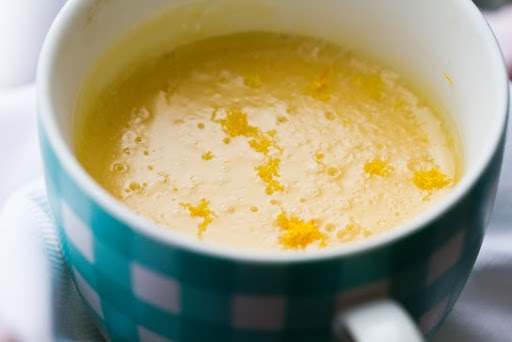 Add in the buttery spread, lemon juice and sugar and continue to stir until mixture starts to bubble and thicken. 3. Reduce heat to low and beat with a hand-held beater for about 90 seconds. 4. Transfer mixture to serving dish and refrigerate until chilled. 5. Store in fridge and eat in 2-3 days. 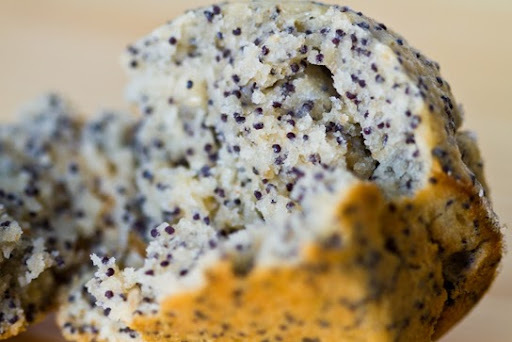 Serving Suggestions: Spread over muffins, pancakes, waffles, dollop onto oatmeal or wheat porridge. Spread over toast or fill freshly baked vanilla cupcakes. 1. Combine all ingredients. Fold well by hand. 2. 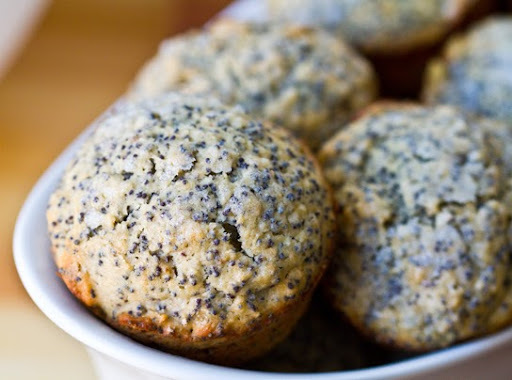 Pour batter into lined or greased muffin tins.